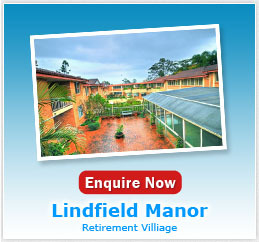 A short 20 minute drive from Sydney city, Lindfield Manor is in a leafy and lively Upper North Shore location. 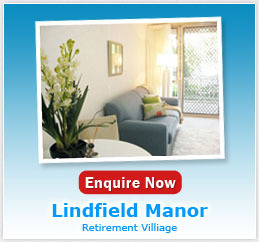 Lindfield Manor is located in a quiet street and a short stroll to Lindfield train station, which includes a Shorelink commuter bus terminal. 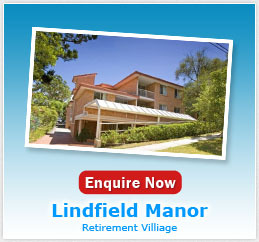 Whilst located in a quiet street away from traffic, Lindfield Manor is also conveniently close to the Pacific Highway, ensuring that travel to other North Shore suburbs or the Central Coast is a breeze. With gated access at the rear of the village to Lindfield Shops, residents enjoy convenient access to supermarkets (including Coles), variety and speciality stores as well as medical and general services. Just two stops from Lindfield train station are Chatswood Westfield, one of Australia’s largest shopping centres, and Chatswood Chase shopping complex. Here residents have the chance to further indulge their shopping needs or maybe catch the latest movies at the cinema. Many Lindfield residents enjoy the great facilities of the Chatswood RSL whilst others perfect their swing at the 5 golf courses that are in close proximity to the village. 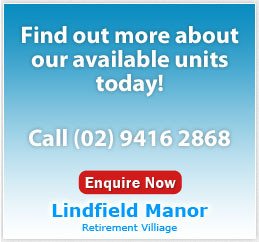 Surrounded by lush parks, Lindfield Manor is approximately 10km away from the beautiful and well known Ku-ring-gai National Park.